Is Wheaton Precious Metals Corp. a Buy? Silver and gold streamer Wheaton Precious Metals has lagged its peers over the past five years. Is it worth owning? Wheaton Precious Metals Corp. (NYSE:WPM) is one of the largest silver and gold streaming companies in the world. However, over the last five years, Wheaton's stock is down nearly 10% while peers Royal Gold, Inc. (NASDAQ:RGLD) and Franco-Nevada Corporation (NYSE:FNV) are up over 60% each. What's going on at Wheaton, and is it worth buying what clearly looks like the industry laggard? The first thing to understand about Wheaton and its peers is the streaming business model. Essentially, these companies provide cash up front to miners for the right to buy silver and gold at reduced prices in the future. These deals are good for miners, as they provide access to capital beyond the equity and debt markets, which aren't always the cheapest way to raise money. For Wheaton and its peers, streaming deals lock in low prices and wide margins in good years and bad. For investors considering investing in the mining space, owning a streaming company instead of miner will usually be the best all-around option. The next piece of the puzzle at Wheaton is its historical focus on silver. In fact, Wheaton changed its name from Silver Wheaton, meant to highlight the importance of the metal to the company's results, to Wheaton Precious Metals in early 2017 (more on this in a second). Silver materially underperformed the price of gold over the past five years. That, of course, helps explain a portion of Wheaton's relatively poor showing compared to its gold-focused peers Royal Gold and Franco-Nevada. The name change, however, is important here because it highlights management's efforts to shift to a more balanced portfolio. In 2013, gold accounted for about 25% of Wheaton's production. In 2017, though, gold's share of production had increased to around 50%. To be fair, that's still less exposure to gold than either Royal Gold or Franco-Nevada, which each get more revenue from their gold-streaming deals than any other source. However, Wheaton is clearly a different company today than it was just five years ago. In fact, for investors seeking a balanced portfolio of precious metals, Wheaton's relatively heavy silver exposure could be seen as a net positive. That said, there's another area where Wheaton stands out: valuation. The company's price to tangible book value is a touch under two times today. Peers Royal Gold and Franco-Nevada, meanwhile, have price to tangible book values of roughly 2.8 times. Simply put, Wheaton is relatively cheap compared to its closest streaming peers. That's largely the result of its lagging stock performance over the past five years, of course. But the company's production profile is notably different today than it was just a few short years ago, so investors may not be fully rewarding Wheaton for the changes it's made. WPM Price to Tangible Book Value data by YCharts. One area where you want to be careful, however, is the dividend. Wheaton's 1.7% yield is notably higher than what you could get from Royal Gold (1.1%) or Franco-Nevada (1.3%), and most miners, for that matter. However, Royal Gold and Franco-Nevada have long histories of annual dividend increases (17 years and 10 years, respectively). Wheaton's dividend is variable, pegged at 30% of the average cash generated by operating activities over the trailing four quarters. This isn't a bad approach, as it allows investors to benefit directly from strong precious metals prices. However, a variable dividend policy means that Wheaton is not appropriate for investors seeking out consistent income. Wheaton has been hampered by its relatively heavy exposure to silver, a metal that has lagged gold in recent years. However, Wheaton has been adjusting its portfolio and gold and silver are now more evenly balanced than they were just five years ago. For investors seeking broad precious metals exposure this could be an attractive investment for this reason alone. More attractive, however, is likely to be Wheaton's low valuation compared to its closest peers. 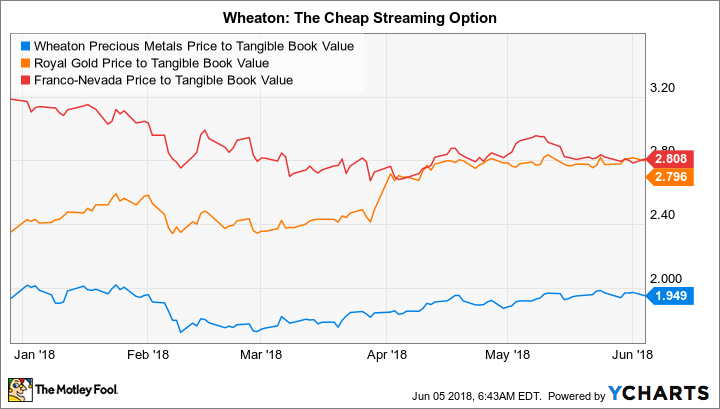 It doesn't appear that investors are giving Wheaton much credit for the changes it has made, which could spell a buying opportunity for those with a value bent.